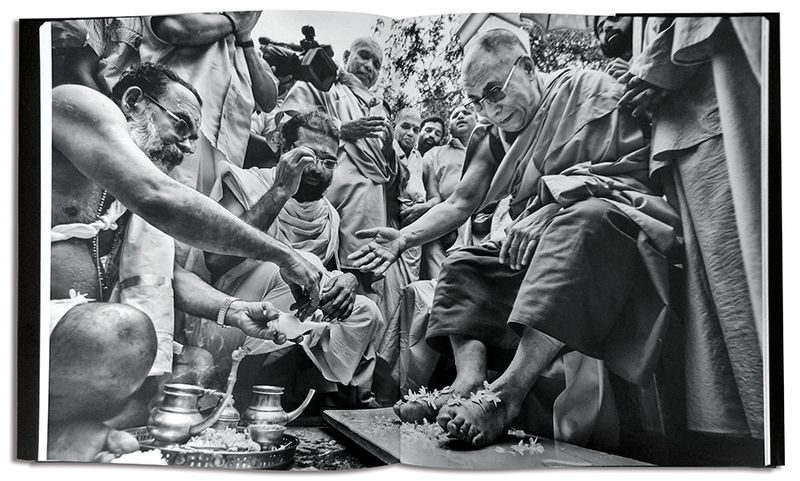 An absolutely delightful selection of captioned photographs and anecdotes from over the years reveals the nature and spirit of the Dalai Lama as never before, discovers K Madhavan Pillai. Living in a land of spiritual gurus and saints, thinkers and philosophers, and historically recorded leaders of religions, it is not difficult to consider that someone regarded as a God could indeed be a person. But the thought of getting to know a God living amongst us is only imaginable, at best. For Tibetans, His Holiness the Dalai Lama is a supreme spiritual guide, a beacon of hope and joy, the reincarnation of his predecessors, who in turn were manifestations of God. For others in India, he is now much more than the leader of a state who sought political asylum decades ago. He is as much of India as he is of Tibet. Loved and respected, his work and presence proved to be the catalyst for the revival of Buddhism, and various movements for peace, change and harmony. 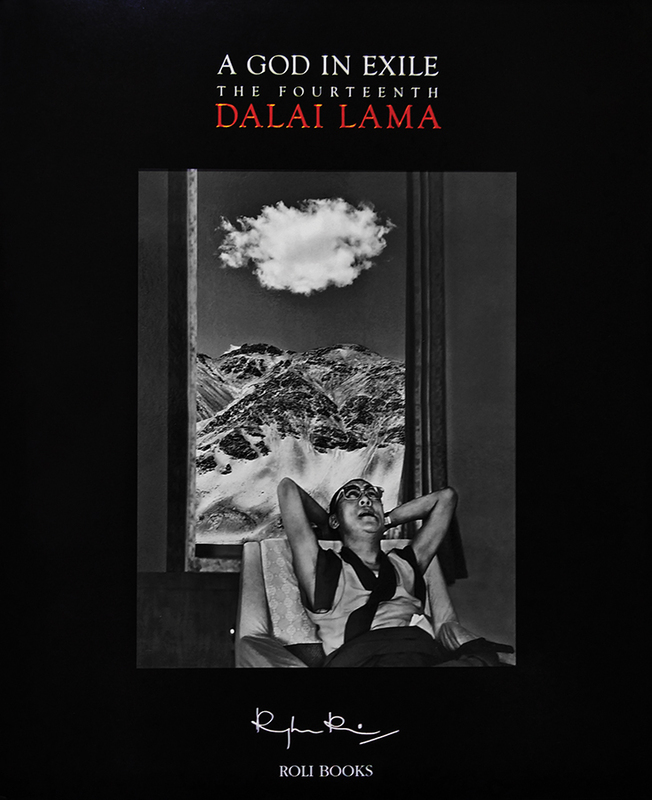 Raghu Rai’s latest book, A God in Exile: The Fourteenth Dalai Lama, is a compilation of black and white photographs from over the years, from across his many assignments. More than anything, it offers a wonderful, rare and precious glimpse into the mind and personality of the much-loved spiritual head of Tibetans, living in exile within India and the rest of the world. easing gestures and expressions, and the mischievous, knowing sparkle that is always present. These are blessings–personal, playful and spontaneous… says the author. The book begins with an excellent introduction by Jane Perkins, detailing the Dalai Lama’s past, supported by photographs from those times, from his birth, discovery, and early years, to his escape from the Chinese occupation of Tibet and his arrival in India, interspersed with descriptions of the prevalent religious, cultural and political landscapes of the time. It ends with a brief letter by Prime Minister Jawaharlal Nehru, penned three days before he passed away, clearly showing his despondence at the futility of starting a dialogue with China on the subject of Tibet. The Dalai Lama greets his guests at his newly constructed ‘palace’, after his earlier home was damaged in an earthquake. 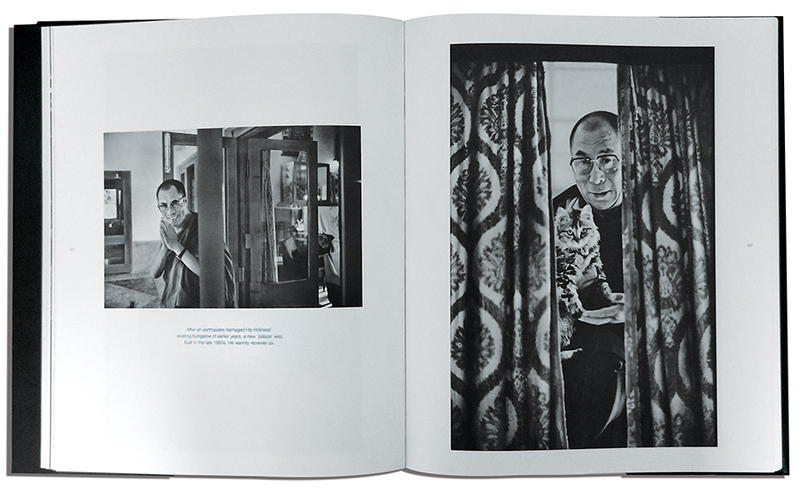 Over the next few pages, you are met with a series of masterful portraits of a younger Dalai Lama in conversation, following a brief narrative by Raghu Rai on his very first meeting. 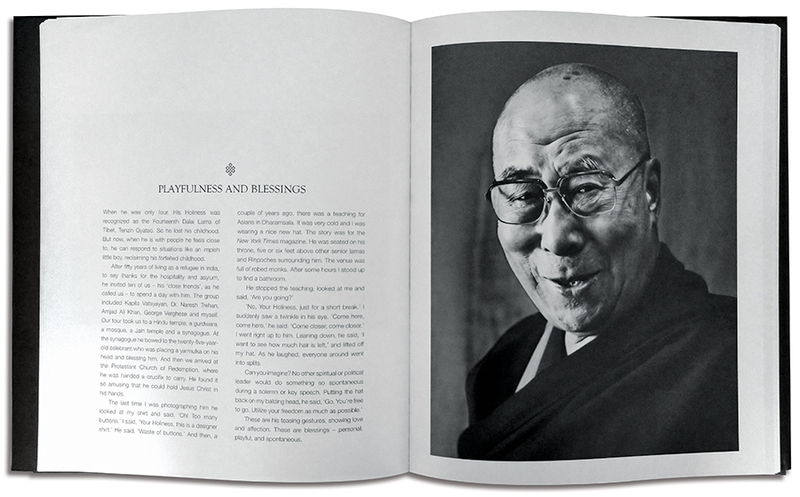 As you continue turning the pages, you see that the book is divided into sections that go on to show the various facets of the Dalai Lama, as a person, through the photographs. Devout, but studious. Humble, but mischievous. Joyful, but concerned. Gentle, but playful. Giving his blessings, and receiving them too. Traditional and ritualistic when needed, but open-minded and participatory. One with the people, regardless of status or social standing, but centered. And interested in pursuits that seem at odds with a God. Gardening, tending to his pet cat, watching Mahabharata on television, repairing the TV set too. 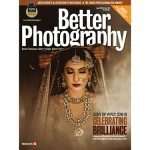 Each section begins with a page of Raghu Rai’s own personal observations, thoughts and anecdotes that help define the relationship they share, as much as it draws an intimate portrait of the Dalai Lama. “His Holiness is an uninhibited, wonderfully loving man. How gracious of him to say he is my friend. 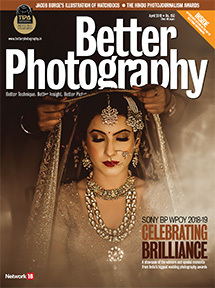 That he comes down to that level to be with you is amazing, and he is like that with everybody: reaching out, holding your hand, giving you his undivided concentration,” writes Raghu Rai. Ritual foot-washing of His Holiness, before praying at Sivagiri Mutt, Kerala. Raghu Rai’s ability to move in close and yet capture unguarded moments, just as much the selection of images and the book’s visual narrative, is such that it ceases to be a barrier between the viewer and the subject, letting you see for yourself. Of all the Gods recorded, perhaps none have been depicted as well as the Dalai Lama.